Transform a window into a stand-up work station with this floating desk. 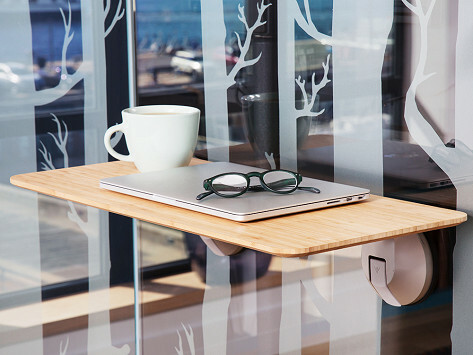 It’s an adjustable and portable solution that ensures your work space always has a good view. The desk mounts securely to glass and other non-porous surfaces (like tile) with industrial-grade suction cups. Sturdy aluminum brackets can handle up to 40 pounds of laptop, mouse—or plants and books after office hours. Industrial-grade, ultra-durable vacuum force suction discs hold up to static 40 lbs. Dimensions: 25" x 12" x 5.5"
Friends Jason Grohowski and Mike Bolos were on the hunt for a stand-up work station that looked as good as it functioned. They created DeskView to deliver standing desk benefits in a portable, adjustable design that works in just about any space—and takes advantage of the view. The streamlined desk was made with windows in mind. Sturdy aluminum brackets are anchored by industrial-grade suction cups that can handle up to 40 pounds. They work with glass or other non-porous surfaces, like tile. The desk is easy to install—like, 10 seconds easy—and is just as easy to move to another spot. Jason and Mike wanted their desk to look good in an office or at home, and we think they’ve achieved it with a floating-like design that blends in and doesn’t distract.